There are only two ways to create an email that can really increase your sales: Recognizing your customer’s weaknesses and getting it’s solution to how to fix them. After all, the problem should to be recognized first to solve it. Right? By the end, you’ll get 10 powerful editing actions that’ll make your sales emails more attractive, engaging, and convincing than ever before. 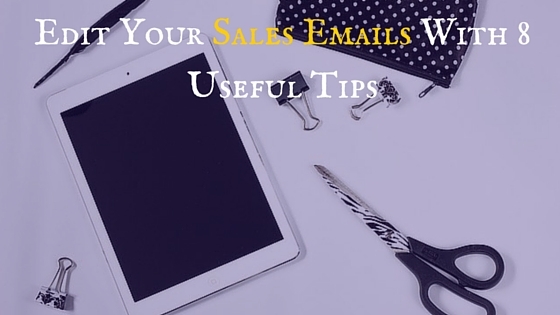 Here are 8 useful and simple tips which will edit your sales emails to make it more attractive. Starting yourself with a question is the best way to indulge you customer in your conversation very fast as it let your customer to think about your question and instantly make a response for it or can say compel your customer to say Yes or No. The idea behind this is that the more you can let the reader to say “yes” the more likely they will indulge into your conversation. Why? Obviously because they’ll feel like only you are the person who is getting his issues and know exactly what they’re going through. Make them say “yes” with your every sentence and they’ll feel that your products or company can help solve their problem. You’ve written to convey a particular message then why you let your customers to read the whole of yours if it can be done with 3 – 4 words. Afterall everyone is busy, bolding your beneficial points will quickly seek the attention of your readers to the information you really want them to know. In-text formatting of any type : italicizing, underlining, capitalizing or back-linking maintains a reader’s attention because our minds are prepared to notice changes. You must have observed that photographers and designers use some negative space to create a focal point, same as that writers can use blank space to draw the attention of readers to the important points you have written. Hitting “Enter” twice leaves a white space between paragraphs. But just because that space is between words, doesn’t mean that I has no purpose there. White space also makes the piece of work appear less congesting and more readable. It mold the message in an elegant frame and polish it which invites readers to go through. #4. Give The Startup Of Your Email Through Words Like Remember, Suppose Or Imagine…. Believe me these words are triggers. They prepare the mind of readers that now you’re going to tell a story, jog their imagination, or paint a picture in their mind (the same way as you’re feeling now). People love listening stories . The word “Imagine” at the beginning of a sentence or paragraph signals to you that you’re about to think something that you enjoy. It generates suspense. And solving the suspense will keep you engaged in about any situation, whether you’re watching a movie or reading an email. “A well-known principle of human behavior says that when we ask someone to do us a favor we will be more successful if we provide a reason. People simply like to have for what they do,” . Go easy with your readers when you write. Make them focus on and make sense of every word instantly and every little point you put in front of them and all of these they have to do online, where attention is primary. So help them in this. Organize your text and will make them more scannable and readable.. Highlight your main points and other key information. Draw the most attraction after your headline and subheadings. Why so harsh? Because adverbs are excellent in weakening your writing. If you want your grab people through you writing, replace that boring adverb-verb combo with a single punchy, attractive verb. Before you send your email, make sure you have checked check your call-to-action correctly. Call to action is that essential part of your email that will say your customer what they are suppose to do next. It should be Clear and Short, Bold and Noticeable, Urgent and convincing. Very Important it should appear with full of benefits. I think clear goals and empathy are the two most powerful primers to an effective email. Having a clear idea of what you are trying to do achieve before writing, and thinking of the other person as you do. Also Emotions play a large part in making any piece of writing interesting. Don’t be afraid to dive deep into problems and use past experiences as examples. The most entertaining writing shares a personal story or funny example to capture sales attention. Your points are absolutely correct. Even I agree with the point that funny examples and personal story can grab your readers very easily and using them to achieve sales attention is the a very good way to let your customers know you better. Thank you so much Anuradha for stopping by and commenting on this post.